Kevin De Bruyne starred and Danilo made his Manchester City debut. On-form: Manchester City star Kevin De Bruyne. Danilo, signed for a reported £26.5million earlier this month, started on the left against his former club at the Los Angeles Memorial Coliseum. 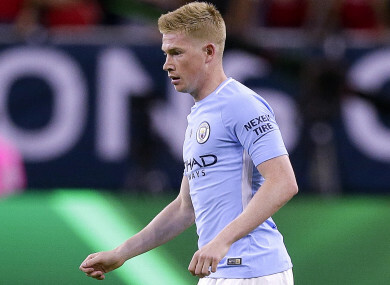 De Bruyne had a hand in the first three goals – his corner eventually leading to Nicolas Otamendi’s opener before he set up Raheem Sterling and John Stones. The win was sealed by teenage substitute Brahim Diaz, who scored a stunning late goal, which was matched by a screamer from Madrid’s Oscar. Spain youth international Dani Ceballos made his debut for Madrid, coming off the bench. Madrid enjoyed the better of the opening exchanges, Gareth Bale shooting high and wide before Isco drew a save from Ederson. City – set up in a 3-5-2 by manager Pep Guardiola – improved as the half wore on and only Keylor Navas denied them a lead. Sergio Aguero put Gabriel Jesus in behind in the 23rd minute and the Brazilian’s low shot was saved by the feet of Navas. The Costa Rica international’s next save two minutes later was even better. Aguero was left in plenty of space in the area and his powerful effort was saved by Navas. That sparked Madrid into action and Casemiro almost opened the scoring in the 28th minute, his header from an Isco cross hitting the post before Ederson saved from Karim Benzema. Luka Modric and Benzema almost combined for the opener, and the latter threatened again before half-time, only to be denied by Ederson. Dani Carvajal wasted a great chance for Madrid early in the second half after a defensive mix-up by City. But City would go ahead in the 52nd minute via a set-piece. Stones met De Bruyne’s corner and his header was parried by Kiko Casilla – who replaced Navas at the break – allowing Otamendi to score into an open goal. After Ederson had smothered at the feet of Casemiro, Sterling – who came on at half-time – flashed a shot across the face of goal. But Sterling made no mistake with his next chance, placing a finish past Casilla at the goalkeeper’s near post after again combining with De Bruyne. De Bruyne almost made it 3-0 in stunning fashion, but Casilla palmed his 30-yard free-kick onto the post. The Belgium international would set up the third, his pass from the right tucked away nicely by Stones in the 67th minute. Madrid had their chances late on before City’s Diaz, 17, struck with a fine 20-yard effort into the top corner with eight minutes remaining, only for Oscar to score with a spectacular strike from 35 yards. Email “Man City romp to 4-1 friendly win over Real Madrid”. Feedback on “Man City romp to 4-1 friendly win over Real Madrid”.